Posted January 25th, 2016 by oceanoracle & filed under Seashells. Flossing May Be Bunk, but Not Mollusks! oceanoracle on Welcome to My Blog! Lilly on Welcome to My Blog! Michelle Hanson on Welcome to My Blog! Kim on Welcome to My Blog! 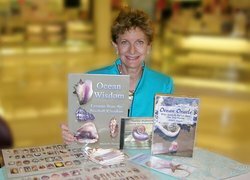 In Ocean Oracle, Michelle “Shelley” Hanson opens up conchomancy (the art of divination using seashells) to a whole new dimension…rich in oracular language that is accurate, scientific, and downright fascinating!... But the test of a divination system is its accuracy. The Ocean Oracle easily passes the test. I expect to see it being used a great deal by Readers across the country.